The Mole-Richardson 400W VARI-SOFT LED Soft Light provides a soft, diffused virtually shadowless wrap around light with a smooth field. 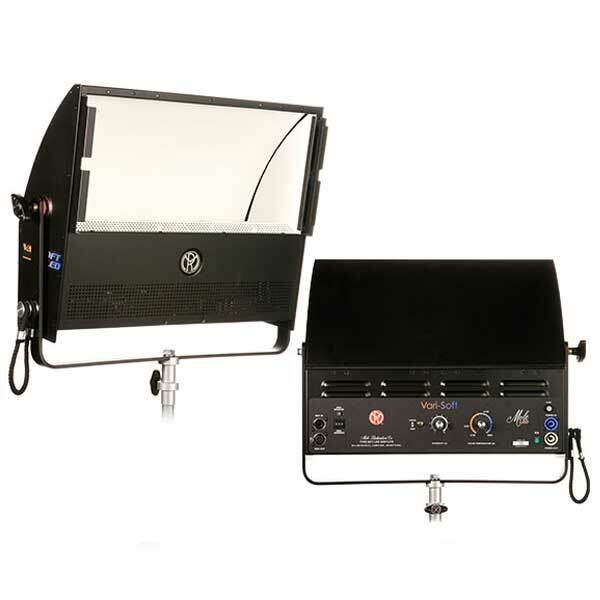 This fixture can be used for television or motion picture as fill light. Designed so that all the light comes indirect and unobstructed from diffused surfaces through a relatively large aperture. The quality of light is equal to the Type 2591 2000w Softlite it descended from. Colour temperature can be adjusted from 2700°K to 5600°K and any temperature in between. Introducing the new Mole-Richardson LED colour changing technology with a range from 2700k to 5600k. Variable-Colour temperature is now available in selected Mole-Michardson LED fixtures. High output, unparalleled optics and full rich colour make the Mole-Richardson Variable-Colour line of LED’s the perfect tool for both broadcast and film industries.